Mark. W. Wilson, ‘Cities of God in northern Asia minor: Using Stark’s social theories to reconstruct Peter’s communities,’ Verbum et Ecclesia 32(1), available here. investigate the rise of Christianity in the five Roman provinces mentioned in 1 Peter 1:1.
prominence as a commercial seaport and the presence of a Diaspora Jewish community. 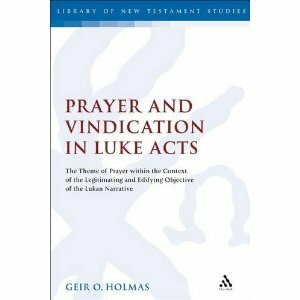 Geir O. Holmås, Prayer and Vindication in Luke Acts: The Theme of Prayer within the Context of the Legitimating and Edifying Objective of the Lukan Narrative (Library of New Testament Studies; T.& T.Clark Ltd, 24 Mar 2011) 329 pages. £70). It can now be bought at Amazon.co.uk(£66.50), Amazon.com ($112.34) as well as at the Publisher, and other bookstores. Geir Otto Holmas is Associate Professor of New Testament at MF Norwegian School of Theology, Oslo, Norway. (His family name is Holmås; on the front of the book it seems to have been changed to Holmas). See further information about this issue here. Update:The LSJ is currently unavailable. After its release last week, the TLG site has been bombarded by pirate sites seeking to download its data. In the process they have caused serious technical and security problems. We regret having to suspend access while we are taking steps to address the security of our servers. We apologize for the inconvenience this action has caused to many legitimate users. R.M. Victor, Colonial Education and Class Formation in Early Judaism: A Postcolonial Reading (Diss. Texas Christian University, 2007). Royse M. Victor, Colonial Education and Class Formation in Early Judaism. A Postcolonial Reading (Library of Second Temple Studies 72; T & T Clark International,2010. If there are any others out there who knows about any other studies that apply postcolonial perspectives to the ancient diaspora Judaism, I would be very grateful to be notified. Please use the comments field below.